French toast always reminds me of two things. 1. That girl in The 40-Year Old Virgin who really wanted Fraaaaaaanch toast while driving recklessly. 2. The part in Better Off Dead where the mom, who was an awful cook, made all “French” foods* for the foreign exchange student/hottie. I need to watch more 80’s movies with John Cusak in them. And I need to make these cookies again immediately. Oui oui! *French bread. French Toast. French Fries. French dressing. So let’s have all the sugar cookies that are a breakfast remix. Pancake and French toast cookies galore! And we can eat them for breakfast since they’re a maple miracle. P.S. Dana said these taste like brown sugar pop tarts and they TOTALLY do. And that kind of pop tart is my favorite right after s’mores. Cream butter and sugar together with an electric mixer. Add egg and beat until combined. Whisk together dry ingredients in a medium bowl. Alternately add milk and dry ingredients to the butter mixture while mixing on medium. Add vanilla and mix until combined. Wrap dough in plastic wrap and chill for 30 minutes. Meanwhile preheat oven to 375F. Roll out dough on lightly floured surface until about 1/4 inch thick. 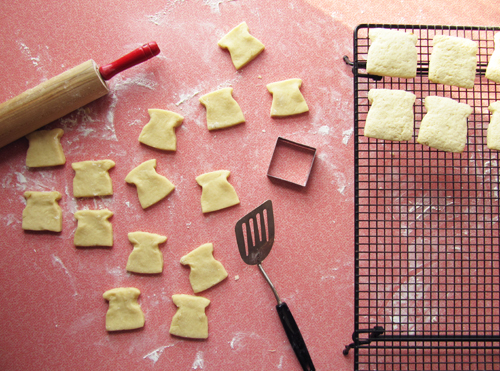 Cut into squares and pinch the top to make the squares appear like bread. Bake for 10-11 minutes. Transfer to a wire rack to cool. 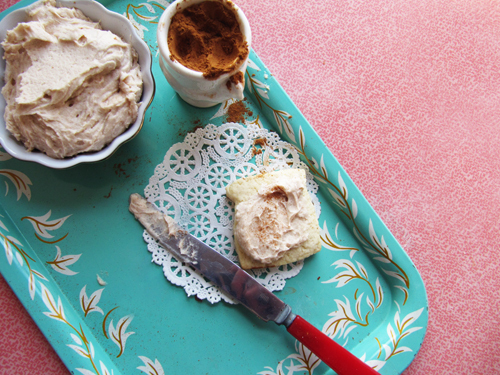 Make frosting by creaming the butter and one cup of powdered sugar together. Add remaining powdered sugar, salt, and maple syrup. 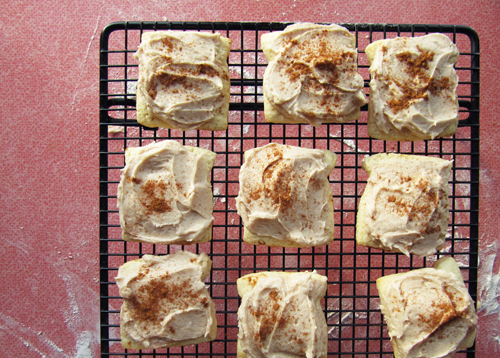 Beat in milk one teaspoon at a time until frosting is fluffy and spreadable. Spread on cooled cookies. Sprinkle with cinnamon. Frost those cookies! Live your life! S’mores poptarts are seriously, seriously the best ever. So glad we feel the same way about this important topic. Yeah man, I’m glad we agree about poptart flava flaves! And thanks! Oh man, a cookie brunch? Hell yes. ah, so cute! I love that these taste like my fave poptart–which maybe makes sense since my favorite french toast tastes like a churro. dessert and breakfast are switching outfits and I love it! Yes! Cinnamon + Suga fo lyfe. So glad you liked these, friend! Such a cute presentation : ) Brav-itty bravo. Thank YOU for having awesome cookie skillz. Yeah! I bet you’d love these, Laura! Shucks, Sydney! <3 Thank you so much! And yes, treating these like cereal is totally encouraged. Yes yes, I definitely want these. With extra frosting! Frosting? Did someone say frosting? Poptarts? Once a kid, always a kid! For real. Poptarts for all! HAHAHAH the chick from 40 yr old version! I always think of that too! 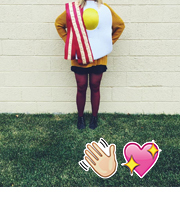 I love your toast shaped cookies – genius idea! 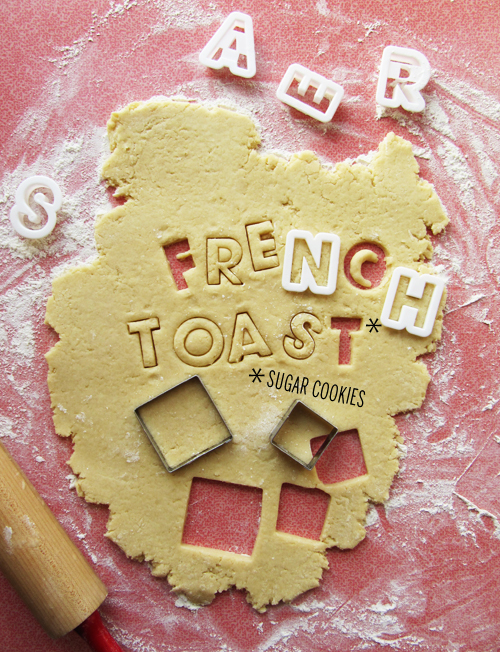 French toast + sugar cookies = the perfect combination. Add a glass of almond milk on the side and you’ve got a well rounded breakfast, am I right? For sure. Breakfast cookies = brookies, I bet! These are the cutest cookies! Oh my goodness, Better Off Dead! Ricky! Ricky! Haha, great movie. It’s a wonder that movie didn’t put people off of becoming foreign exchange students. John Cusak was king of the 80’s for sure.
! you made them look like bread! i love it. im also making your cobb salad tonight w. salmon and feta. yum. also. love your site! 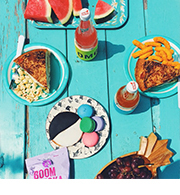 Next post: Let’s snack our lives away.